Open the Page Setup Manager. My last post demonstrated doing this by right-clicking on a layout tab; alternatively you can also right-click on the thumbnail of a layout if you’re using Quick View Layouts. 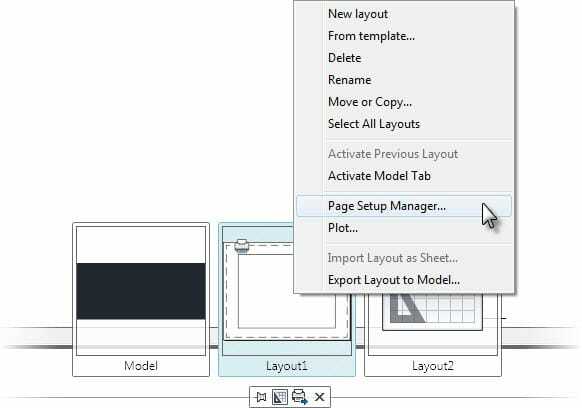 With the Page Setup Manager open, click the Import button from the right side of the dialog. Browse to the DWG or DWT file containing the page setup you want to import and click Open. This opens the Import Page Setups dialog box. 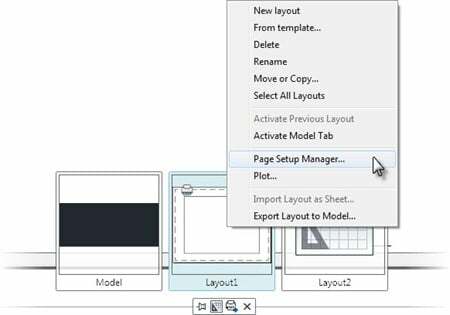 The Import Page Setups dialog box will list each of the page setups stored within the selected DWG or DWT file. 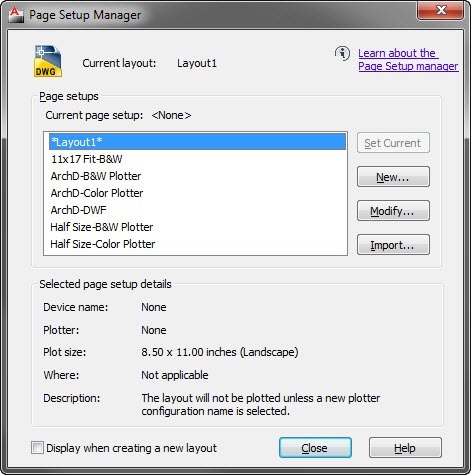 Select the page setups you would like to import, and click OK.
Each of the selected page setups will import into the current drawing, and display on the Page Setup Manager dialog box. 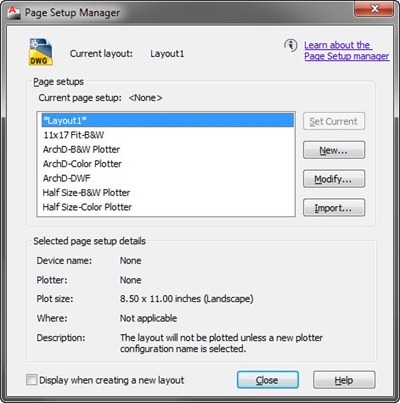 As seen in my last post, any page setup listed in the Page Setup Manager dialog box can then be assigned to any layout in that drawing. That’s all there is to importing page setups from one drawing to another. It’s worth nothing this is an import, not a dynamic link. Therefore changes made to a page setup in one drawing will not push to a second drawing. If these changes are needed in both drawings you could always re-import the page setup. How can this be useful for me? 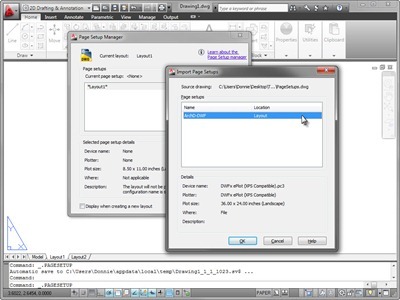 By placing a page setup template (DWG/DWT) on the network, your users can access, import, and apply a consistent set of plotting configurations. This takes the guesswork assumed by the user when they want to do something as common as plot a black & white drawing in color. Just import the necessary page setup, apply to the layout, or temporarily override using the PUBLISH command, and your plot is done! Just looking for solution of importing the page setups. After I hit “Import” and open the drawing which has page setups the page setups don’t show any setups. I’m having the same issue! Please let me know if you’ve figured it out. I was wondering if anyone is having an issue in using a page setup created in a drawing using ACAD C3D 2012 that in 2014 can’t be selected as an option to use for plotting? We have been using this method, but have come across a problem. What happens when the page setup changes in the source template and you want all drawings with that page setup to be updated? So far I can’t find a way to do it without opening each drawing. Use lisp to do it for you. Write a lisp program to import the new page setups from your template (dwt) or any dwg and then use scriptpro (free from autodesk) or DotSoft’s superscript to run the lisp program on every dwg that needs the updated pagesetup. Easy cheesy lemon squeezy. Thanks Donnie, I like the override publish tip.